Not long ago I reviewed a book about the Detroit Red Wings where authors Kevin Allen and Art Regner collected first hand accounts from the greatest Red Wings players on their years in Detroit and just how special the Red Wings were to them. 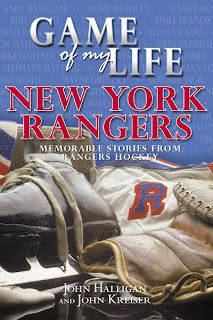 In very similar fashion, authors John Halligan and John Kreiser tackle the same project, only this time with the greats of the New York Rangers in the book Game of My Life: New York Rangers . The book is part of an eclectic series put out by Sports Publishing LLC. Actually, the scope of this Rangers book is quite a bit more narrow than the Detroit book titled What It Means To Be A Red Wing. As the Game Of My Life title suggests, the Rangers players are only asked to reminisce about their favorite game they played in while wearing Broadway's Blue Shirts. The book features memories spanning a great range of hockey history in Manhattan. The authors somehow reach all the way back into hockey history to the days of Frank Boucher and Snuffy Smith, and progress to the modern days of Jaromir Jagr. Even busy superstars Mark Messier and Wayne Gretzky participated, making the book seem whole and complete, unlike the Detroit title. In between those years many of the Rangers greats have contributed. Andy Bathgate, Gump Worsley, Harry Howell, Bones Raleigh, Rod Gilbert, Vic Hadfield, Cat Francis, Brad Park, Pete Stemkowski, Steve Vickers, Don Maloney, John Davidson, John Vanbiesbrouck, Mike Gartner, Adam Graves, Stephane Matteau, Neil Smith, Mike Richter and Brian Leetch all speak about their favorite New York memories. Now obviously you will notice a few names missing right away, notably Phil Esposito, Jean Ratelle and local boy Nick Fotiu, amongst others. This is no knock on the authors by any stretch of the imagination though. For various reasons not all players participate - Espo had his autobiography out at about the same time, for instance. But the book somehow feel a little bit empty without some players. All in all, a pretty good book that should interest most long time New York Rangers fans. Our book has been out for a while, but I appreciate your comments. We did our best to include the whole of Rangers history. It was impossible to get a few guys (Giacomin and Ratelle), and we were somewhat limited by the "game" concept on others. We did get one of the last interviews with Gump Worsley before he died, and having Mark Messier call me from Barbados was kind of neat. Oh, and the publisher (now in Chapter 11) was less than no help.